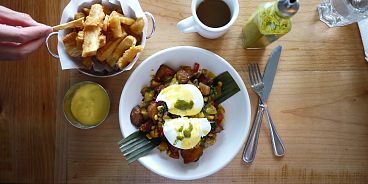 There’s a new amazing Peruvian brunch in town and you’ll find it at a small, unassuming restaurant at Broadway and Main Street. Chicha has stuck to dinner service only for the past year or so, but they recently launched an extremely unique brunch menu offering excellent twists on Peruvian classics. I tried the hefty Loca de Zapalla Hash and it was nothing like anything I’ve had before here in Vancouver. With roasted butternut squash, sauteed kale, corn, zucchini, super crispy seasoned potatoes, two beautifully poached eggs and a Peruvian chili hollandaise, it was absolutely swoon-worthy and a total must-try. The Huevos Benedicts are also fantastic. Try the gluten free version which comes on crispy baked corn zucchini and yucca cakes. On the side, the housemade quinoa and honey bread served with fresh jam should be mandatory — I’d have bought a loaf if I could. View Chicha’s full brunch menu.